What is SAFE SOLUTION Anti-Slip tile treatment? Safe Solution® is a treatment, not a paint or coating, that is applied to non-porous hard mineral floor tile. Prior to the application of Safe Solution®, when water or liquids puddle on these surfaces, you are actually hydroplaning on the film from the water or contaminants. Safe Solution® is a three part chemical solution treatment, designed to increase traction by creating microscopic channels in most hard mineral surfaces; such as: ceramic tile, clinker/quarry tile, porcelain tiles, granite, and steel-enamel bathtubs. It is biodegradable and environmentally safe. After the Safe Solution® Anti-Slip Treatment is applied, a microscopic channel is created for any water or liquids, to be disbursed from the surface and under foot, allowing better contact with the top surface at all times. 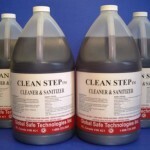 Clean Step™ is an antibacterial, nontoxic, high performance, cleaner, that has been formulated to be used from the toughest commercial applications to cleaning windows. Its dilution capabilities make it very cost efficient, for a daily cleaning regimen. Food Safe cleaning, for a myriad of industrial, commercial, and residential uses. Click Here to read more. The Safe Solution® Treatment creates microscopic channels, allowing for the water to be dispersed from underfoot. A Safe Solution® surface may actually feel dry, when wet, especially in Bath Tubs! Will not chip, peel or discolor. Not a film or coating. Global Safe Technologies Inc.'s products provide a cost effective and highly effective solution to the numerous safety and cleaning problems faced in commercial applications. This is a traditional manufacturer-wholesaler-retailer business and not multi-level marketing. We are the manufacturer.